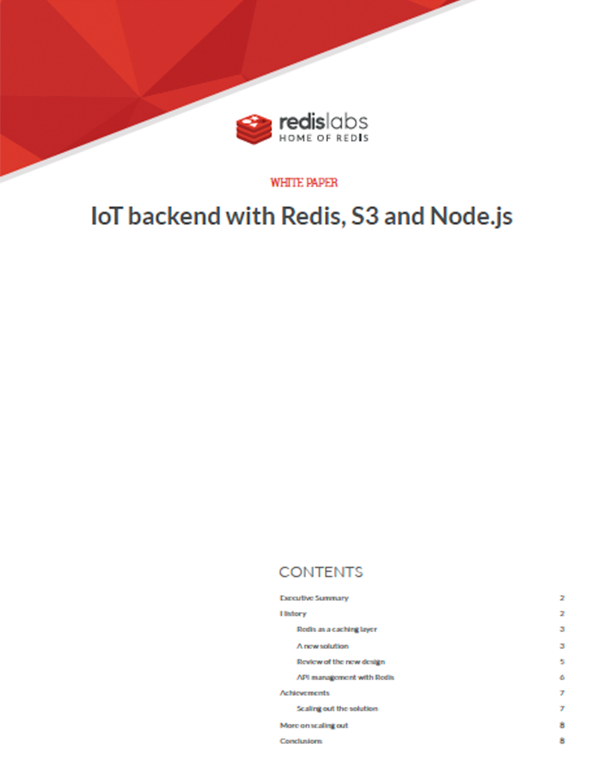 Redis is a perfect solution to support IoT backends when significant amounts of data need to be ingested from multiple devices and be made available via APIs. Relational database technologies fall short in this scenario and complex and expensive NoSQL solutions are usually suggested. The IoT industry is still in its infancy, though, and in a very competitive environment like this it’s common for companies with unproven business models to try to evaluate innovative solutions at a rapid pace. In these circumstances, cost is a decisive factor in making Redis the technology of choice as it allows for speed, flexibility and simplicity with limited compromises. The solution outlined in this paper supports collecting and exposing energy readings from smart meters with an extremely low TCO (Total Cost of Ownership) and little to no data maintenance.The techniques exposed here also apply to a multitude of other use cases/scenarios in the IoT space.